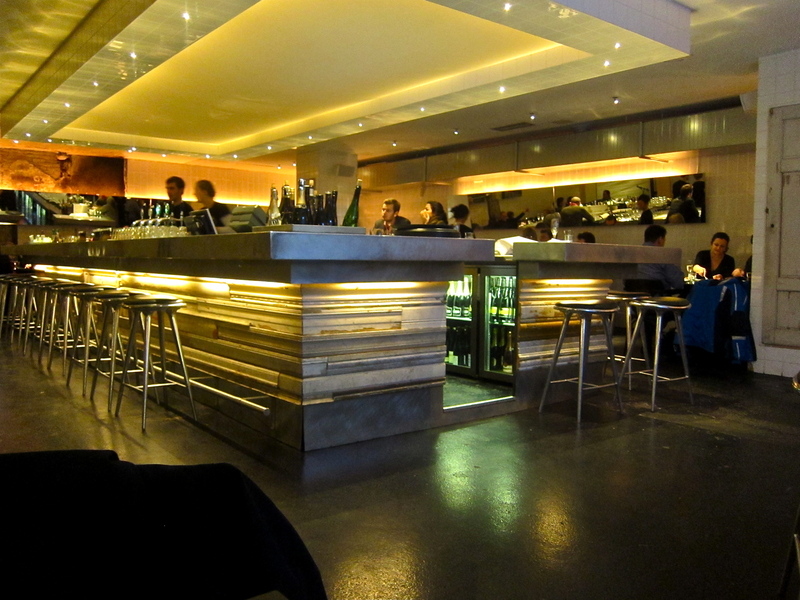 A wonderful seafood restaurant in Copenhagen’s meatpacking district. Service is warm & knowledgeable without being pretentious. Food is well-balanced, clean & engaging. 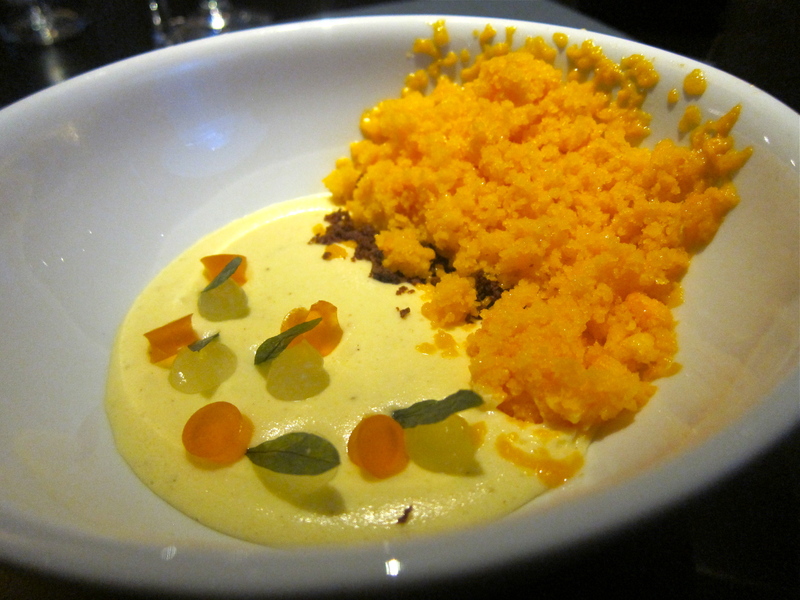 And please, please have the sea-buckthorn dessert if it’s on the menu. Not the cheapest place for sure, but worth the price based on my single visit. Where do you eat the night before you’re having lunch at the best restaurant in the world? That was the question. After asking some trusted sources, the answer (or answers) seemed to be pretty straightforward. I should either go to Ralæ, a recently-opened venture by an ex-noma chef quite definitely trying not to copy noma’s formula; Geranium, although some felt it didn’t yet live up to the hype surrounding it (and this was even before their chef won this year’s Bocuse d’Or); The Paul, which was meant to be fun; or Søllerød Kro, a classic restaurant that was a little bit out of town and a lot expensive. Unfortunately, the first and third were shut, and the second and fourth were a bit too formal and expensive, plus one was out of town. 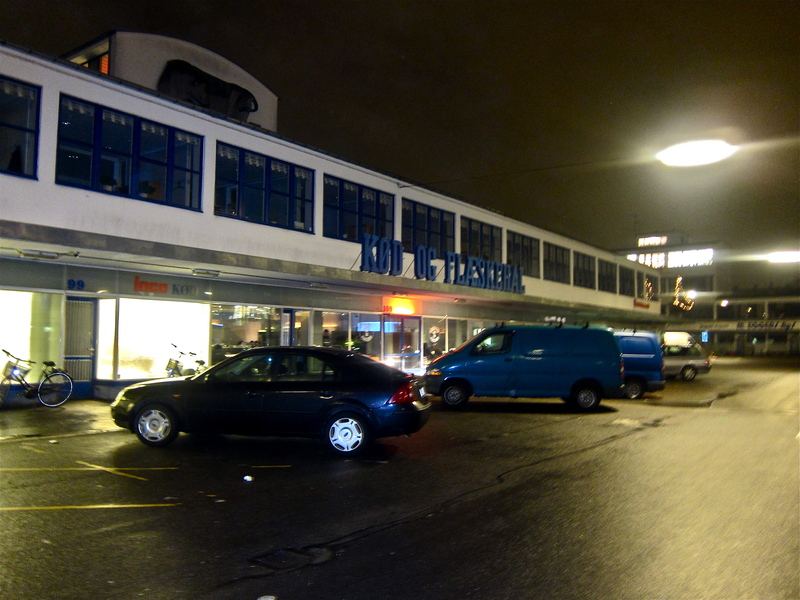 Instead, I was directed to a rather new restaurant in Copenhagen’s ‘meatpacking’ (‘kødbyens’) neighborhood, which has also received its fair share of positive press since opening in June 2009. Enter Kødbyens Fiskebar, the casual yet stylized seafood-centric restaurant whose kitchen is also – lo and behold – run by (yet) an(other) ex-noma chef. Does this look like the façade of one of Copenhagen’s best restaurants? It was within a 15-minute walk of my hotel, though it seemed a bit longer than this due to the well below-freezing mid-January temperature. If you don’t look closely, you might miss the restaurant completely, as the façade looks like some low-rise concrete monstrosity with a large blue sign that says something other than the restaurant’s name. Thank goodness for Google streetview and the free WiFi offered at my hotel. When I walked in, the bar stood immediately before me, and there were a number of staff members ready and waiting to greet me. Unfortunately, I had a slightly embarrassing thing to say. I told them that I had a reservation…for one. They asked me for my name, which I gave, and they all suddenly proclaimed in unison, “Oh, you’re [INSERT REAL NAME HERE]!! !” I almost burst out laughing as they were all smiling and it was a possibly a bit ridiculous to have booked…but hey, you never know with popular restaurants, right? The guy who appeared to be the main waiter asked if I had heard about them in Canada (where they apparently thought I was from for some unknown reason) and I explained to him that a friend from the US had been recently and really enjoyed it, etc. As the name indicates, the order of the day is mostly piscatorial, and one if the main design features of the place is a ginormous fish tank around which you can sit on stools if you so wish. 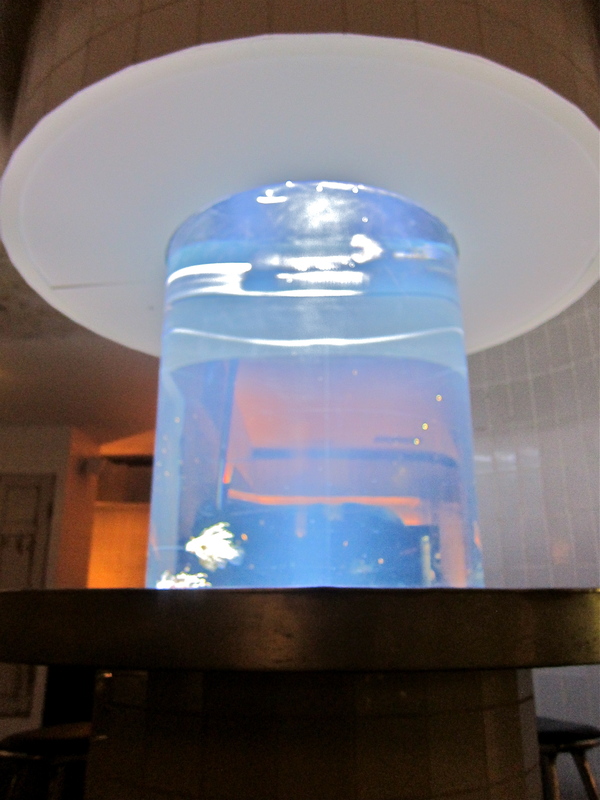 I had a great view of the fish tank and the main bar, and proceeded to plunge myself into studying the menu. The same waiter noticed my studious concentration and came by to explain each dish to me in full (in English), which was much appreciated. I had a look through the wine list and immediately noticed that there was a Danish white wine on the list. Yes, a Danish wine. I asked if it was any good, and the waiter rambled off some long story (okay, it wasn’t that long), which I now cannot recall, and won me over to trying it. Good thing too. The wine was wonderfully refreshing, and was composed of Sauvignon Blanc as well as another (I want to say local) grape. Perhaps wishfully thinking, my tasting notes reveal that it had “a slight saline taste, perhaps from the sea” – though I doubt some people would agree with that rationale for the slightly salty taste. Anyway, I really enjoyed it. Soon thereafter a pretty large loaf of sourdough bread was lopped down before me, along with an upside down cone of organic Danish butter with buttermilk. 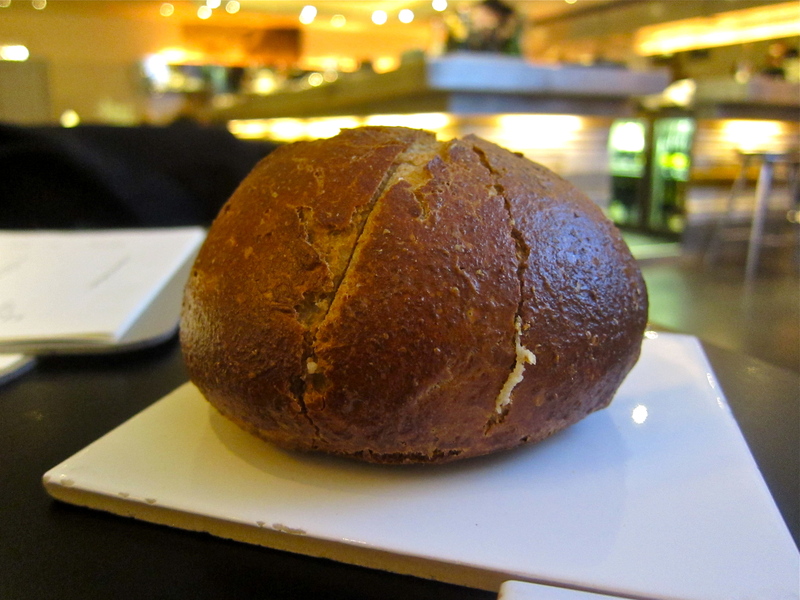 As with most of the bread I sampled in Copenhagen on this trip, it was excellent…as was the butter, once it had a chance to get warm and soften up a little bit. 8/10. On my friend’s recommendation, I decided to stick mostly with the small plates, which turned out to be a good plan, especially as I was now definitely dining solo given Mathilde and David’s flight was delayed. 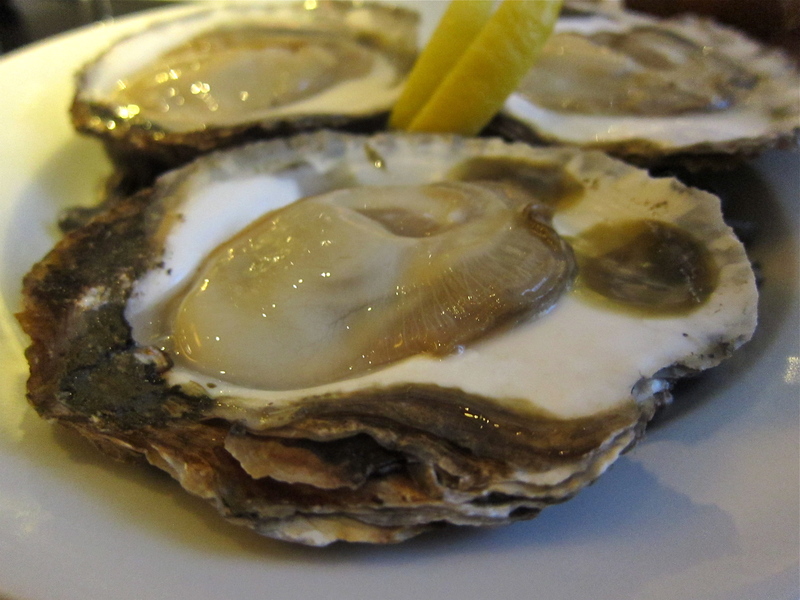 First to arrive was a plate of three Danish oysters. Readers of the blog will know that I am not the world’s greatest expert on bivalve molluscs, but expert or not, these were friggin’ huge. To my untrained tongue, they were truly excellent: meaty and only slightly tasting of the sea, served with a great punchy vinaigrette. I would have had three more if my next plates didn’t arrive just as I was finishing, to use the parlance of our times. The aforementioned Danish wine was excellent with the oysters too, by the way. 9/10. 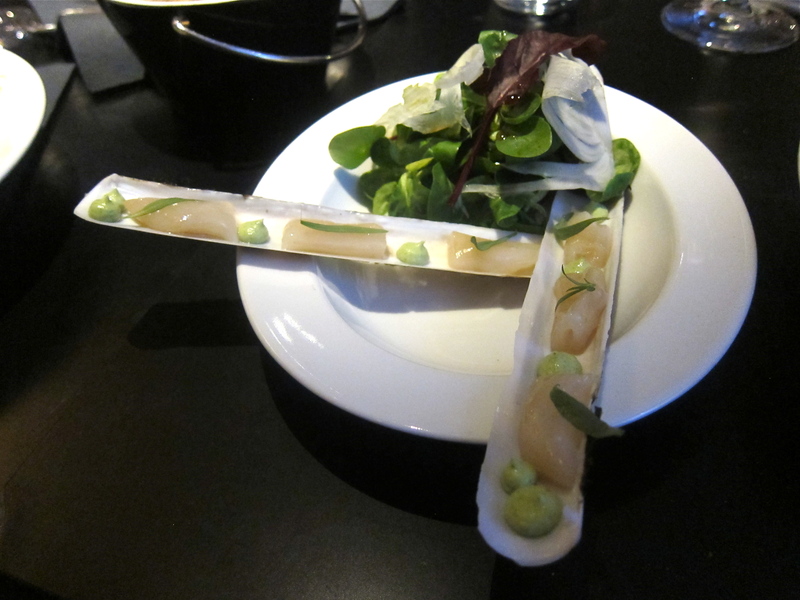 The next two plates arrived simultaneously, and I opted to tackle the razor clams first. Although a simple and visually appealing dish, I wasn’t quite certain of the best way to go about eating it. I managed, though, and thought the clams themselves were very good. The herb cream – which seemed to contain tarragon and garlic – was an interesting flavour to pair with these slivery discs, but I felt that it dominated the clams and wasn’t wholly balanced, even though there were only small dabs of the cream. The standout component of this plate for me was the salad, which had the most amazing dressing that was sweet but acidic and spicy too. Overall this dish was good but not my favourite of the evening. 6/10. Last of my small plates was a beautifully presented little bowl of bleak row that was matched with fairly traditional Scandinavian accompaniments of onions and sour cream – with a few pea shoots and chives thrown in for good measure. I decided to taste these together on their own before spreading it on the crisp breads, which had been provided in a cute little metal bucket on the side. 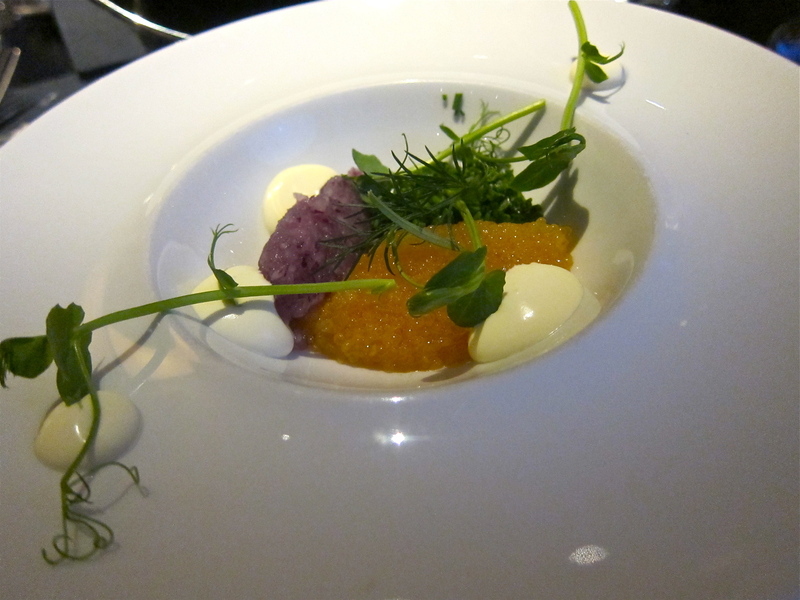 The roe itself was excellent, and the other ingredients worked harmoniously with its saltiness, providing sharpness, herbaceousness and creaminess. I enjoyed the three thin ‘breads’ both on their own and with a bit of the roe. There was a razor-thin slice of fried ciabatta, as well as a delightfully light potato crisp which was well salted (this was my favourite – basically a posh potato chip) and a normal Danish flatbread with tons of different seeds stuck to the top. 7/10 for the dish as a whole. As a side-note, I had ordered a second glass of wine (2009 Picpoul de Pinet, Croix Gratiot, Coteaux de Languedoc), which I really didn’t like very much and didn’t seem to go too well with the clams despite the suggestion from one of the waitresses. 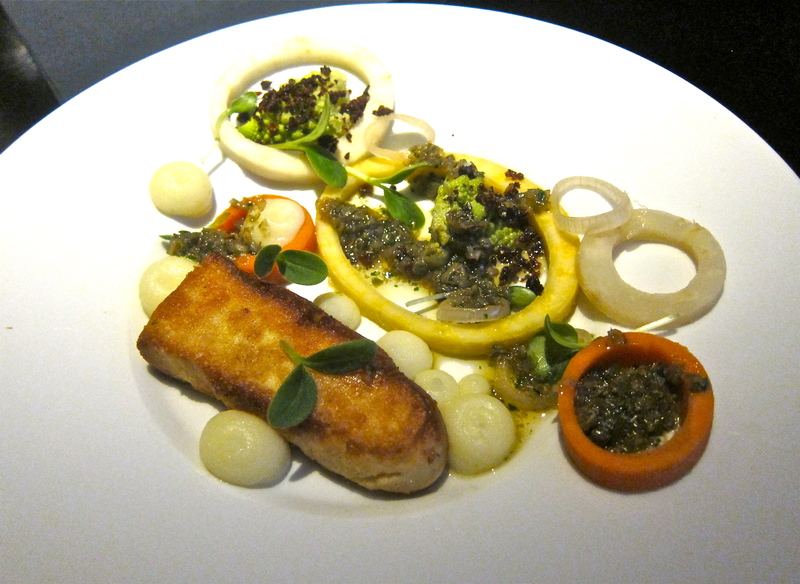 For my one medium-sized plate, I went for the cod roe. And I was glad I did, because it was a total triumph. The roe itself had been smoked and seared perfectly. Served alongside the golden phallice were pickled vegetables of all sorts – carrots, celery, kohlrabi, plus many others that didn’t start with ‘c’ or ‘k’ – and all tied together with a rich but deftly portioned brown butter sauce. There were also a few dabs of buttery mashed potatoes and some fresh cress to finish it off. The dish as a whole had a great variety of textures and was an amazing combination of sweet, salty and smoky. It was one of the best things I ate in Copenhagen during my short stay. 9/10. I was head-over-heels in love with my orange and yellow dessert too. It consisted of frozen and shaved sea-buckthorn (or ‘havtorn’ in Danish), lemon cream, tonka bean and white chocolate, as well as little gel capsules of sea-buckthorn and a few green leaves placed delicately beside each disc of jelly. The icy texture of the grainté melted into the truly luscious cream and the chewy gel reiterated the somewhat bracing acidity that accompanies the bittersweet berry. The heat, which I believe emanated from the tonka, was also a nice surprise. This was one of my favorite desserts in a long time and, even though it was a very generous portion, I really could have had another bowl. 10/10. 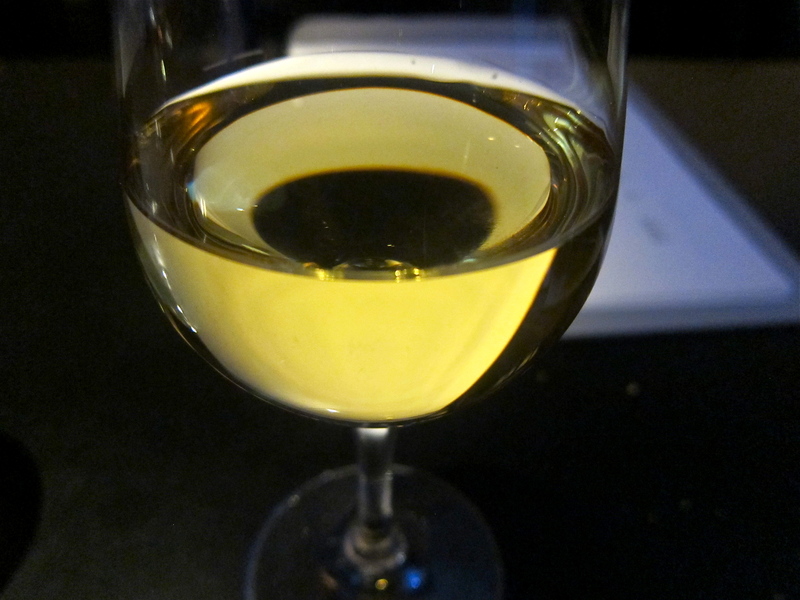 The sweet Riesling I ordered went very well with the desert, and actually mirrored it perfectly – luscious sweetness kept in check by a steely acidity. The thing I liked overall about this restaurant was that the formula seemed to have been thoughtfully calibrated to make the diner’s experience just right. It has an unassuming façade; a rustic yet stylish interior design; a menu that is simple, focused and straightforward; helpful and friendly service; and well executed, clean, exciting food. I immediately felt at home, and was welcomed warmly. While there was one brief lapse in service – when I sat with an empty wine glass for more than a little while – it was soon rectified by another waitress who spotted the situation. Everyone I interacted with was knowledgeable and eager (but not too eager) to explain something as and when I showed interest. While they do take their enterprise seriously, they do not take themselves too seriously. They know what they’re doing and they’re good at it – nothing more, nothing less. I wish more restaurants could be like this. Too often, very good food is accompanied by an annoyingly cutesy, smug and/or a condescending attitude (did you read my review of ko?). And all too often, so is not very good food. I think the Danes have a good model going: they know what they do well, are proud to offer it to you and let you enjoy it…and they know how to do this without showing off. That’s what I experienced on my trip at least. 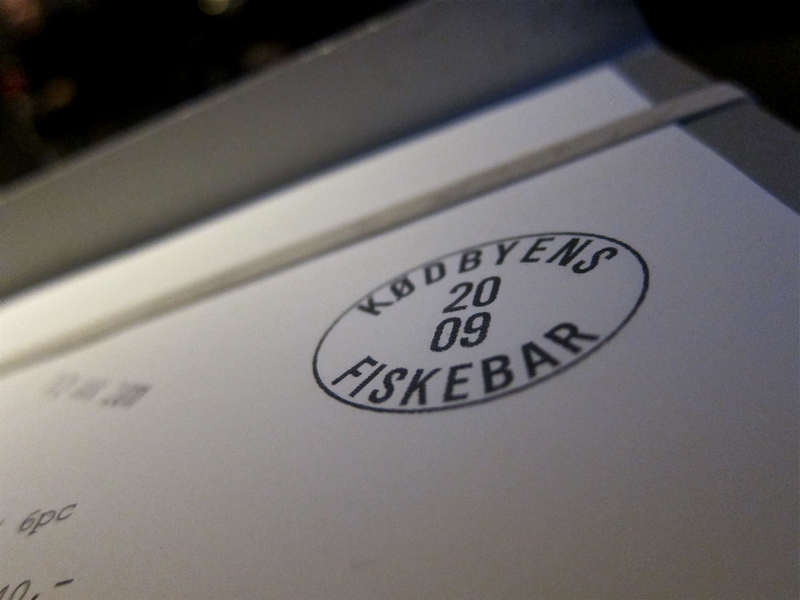 Suffice to say, if you are in Copenhagen, whether you have the good fortune of going to noma or not, please try out Fiskebar – it was a gem of a find for me, and I hope it will stay that way for you. 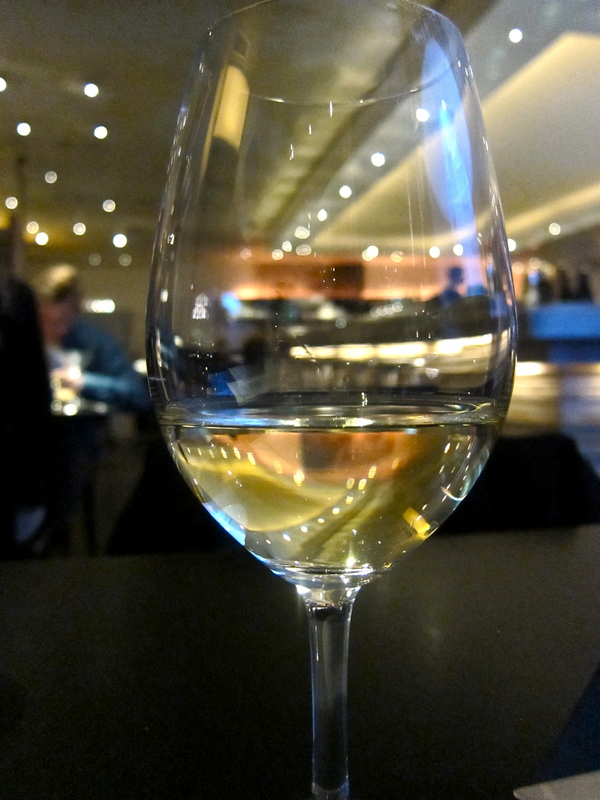 Wine: I only looked at the by-the-glass list, which had a red and white house wine at 50 kroner per glass, plus 4 whites, 3 reds, and 2 sweet wines priced between 70 – 120 kroner per glass. The producers were well-chosen but the prices did seem expensive…maybe this is just the Copenhagen factor, though. Le Bernardin is all about refined elegance. The service is discreet and professional; the food is original, inventive and lifts some of the seafood on offer to its highest state; and the dining room is an oasis of calm. It does not scream loudly, but is quietly confident. Highly worth a visit. When I knew I would be heading to New York for nearly a week, and that I would only have one or two nights to spend in Manhattan itself, my mind began to race: where could we have one really nice dinner in the Big Apple? I don’t get there nearly as often as I used to, so it had to be a well considered choice, with no margin for error. My thoughts drifted from obvious choices like Thomas Keller’s Per Se, to which I still have not yet been, to other places I hadn’t been to for a little while, such as Aquavit (a perennial favorite), Mario Batali’s Del Posto (where we had an excellent family event last year), Jean Georges (which we went to last time we were in the city and loved) and Daniel (always great). Then, there were so many new openings which sounded interesting, that I was getting a bit lost…until I remembered the remarkable serenity of Le Bernardin, the seemingly forever 3 Michelin-starred restaurant where I had partaken in an excellent lunch in my younger years (the memory is hazy but I remember I loved it), and to which I had always wanted to return for dinner. Eric Ripert, the head chef at Le Bernardin, is a renowned culinary artist with seafood, and is a familiar face to food television viewers in the US after having been a feature on programs such as Top Chef, where an episode recently featured him and Le Bernardin. He is also a good friend of Anthony Bourdain, another Food TV personality and proprietor of a good restaurant in his own right (the steak frites at his Les Halles in NYC are still ‘bloody’ great). The food blogosphere is chock full of extremely positive reviews of this NYC culinary landmark, and I was certainly getting excited to go back. However, I did take note that Chef Ripert says that the fish is the main ‘star’ of his menu, and the accompanying flavors are simply meant to complement and to highlight the fish. Thus, my expectations were not that I was going to experience something that would take the various tastes of fish to ‘another dimension’, but that each piece of fish would be given the best chance it had to dazzle…but more on that later. Le Bernardin is thoroughly French, with Maguy Le Coze (the owner) opening the restaurant in New York in 1982 to critical acclaim. Before the American iteration of Le Bernardin, she and her brother Gilbert had opened a restaurant of the same name in Paris in 1972. They originally hail from a small fishing village in Brittany, and are from a thoroughly ‘fishy’ family, with her grandfather being a fisherman and her parents owning a small restaurant-come-hotel in the village. As my marriage is also a French affair of sorts, I figured the whole thing fit and would be a good idea. So I made the reservation for deux. Done. I should have known better. Dinners in my family are rarely straight-forward. I learned a few days later that my father would now be in New York during the weekend of the booking. And this meant a rapid change of plans as my Aunt would now surely come into the city that weekend (which was great) plus, since we would all be together, my brother and his girlfriend should definitely come too. I thought we might encounter a problem changing things around with such short notice on a Saturday night, but luckily it was fine, and they upgraded our table from two to six. Phew. We all arrived at the restaurant slightly early, except for my brother, who made a late appearance and rushed straight for the men’s room to dry himself off – no, it wasn’t raining, but it was one of those unbearably hot and muggy days in NYC, and he was sweating like crazy after running around all day on the streets and in the subway. We waited for him in the pleasant air conditioned bar area (hehe), where we had been given some great homemade parmesan breadsticks to munch on, and eventually we made our way to the table. It was a good sized circular table near the window (a bit too close to the entry way for my liking, but I was very glad just to have it). We settled ourselves into the comfortable chairs and soaked up the calmness inspired by mellow colors and the attractive teak wood panelling that abounds throughout the interior. But we weren’t there to sit, we were there to eat. 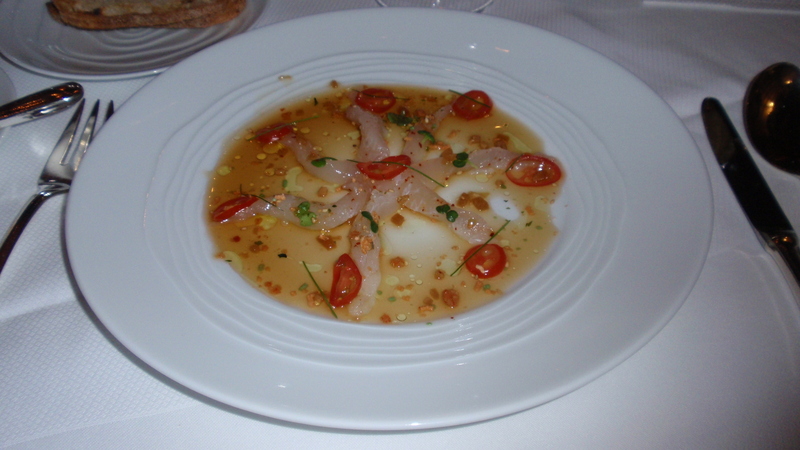 I must admit I had a bit of trepidation about the food – not because I thought it would be bad, but because Le Bernardin is renowned for its seafood, and that’s not always to everyone’s taste. Plus we were a table of six very finicky eaters. For instance, my Aunt has been known to send back many a piece of fish in her day for not having it cooked the specific way she asked for it…but that is another story. Once we were given what has to be one of the most extraordinary menus I’ve seen before, I knew we had nothing to worry about, even if the dishes only tasted half as good as they sounded. The menu is a barrage to your senses and imagination. It is arranged in a rectangular, landscape-layout fashion and is broken up into four sections, which you read horizontally across the long part of the page. There is ‘Almost Raw’, ‘Barely Touched’, ‘Lightly Cooked’ and ‘Upon Request’. As far as I can remember, all of the dishes from the first three categories have fish as their main, or one of the main, components. The latter is mostly non-fish main course options, such as kobe beef, duck and squab. The flavor combinations, the variety of fish available, and the diversity of preparations (and of the ingredients themselves) was really staggering, and there wasn’t one thing on the menu that any of us did not like the sound of. This, of course, can lead to a bit of a quandary, because there are also two tasting menus available, which capture some of the chef’s signature dishes. After literally a half an hour or more of reading through the menu, we finally decided that we would go for the ‘normal’ four course menu (two starters, one main, one dessert). My brother and I used sign language across the table to let each other know that we would be ordering a supplementary course, because there were a few too many dishes which looked like ‘must-haves’. 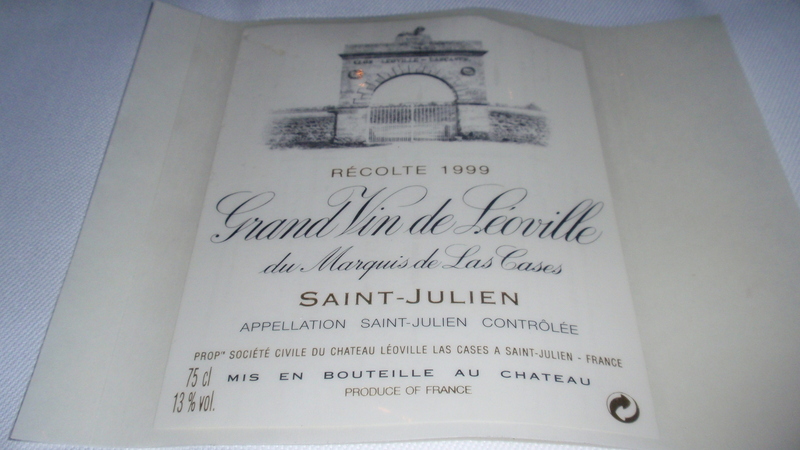 Once everyone had chosen, my father chose a beautiful bottle of white wine (see below), and we were off and running. The food began arriving, and it looked amazing. 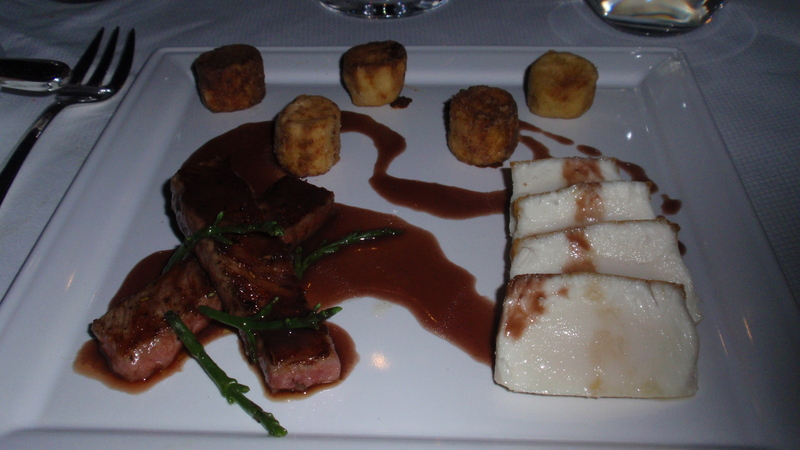 Each dish was very individually and beautifully presented. As there were six of us, it would be too difficult to review more than one or two of the individual meals in detail, so I have put a photo for each dish that we remembered to capture with the camera, along with a brief description and rating (where either I or Mrs. LF tasted the dish). You can click on any of the photos to see more detail. We were all brought a little cup of what looked like a broth of some kind. The waiter explained that it was a lobster and avocado ‘soup’, and we were eager to try it. 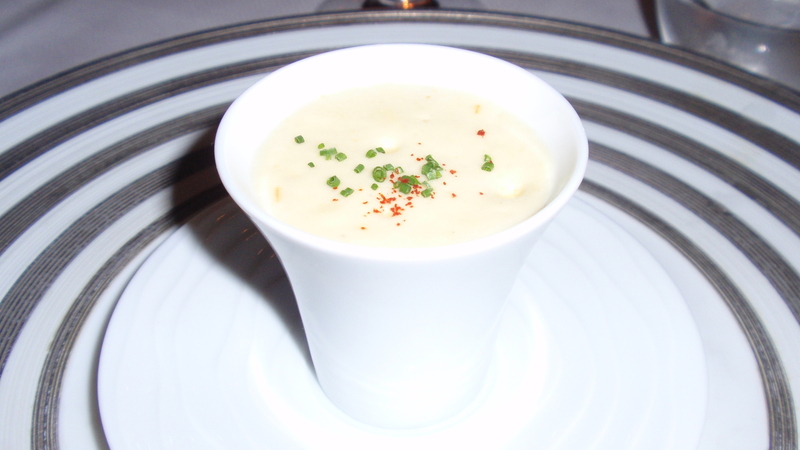 It turned out to be much thicker than we had expected – amuse bouches are often lighter broths that you can sip in one go – but the flavors were fresh, distinct and went well together. The top half was warm and contained the lobster, while the bottom half was cool and had little chunks of avocado. It was an interesting and good start to the meal. As I put the first bite into my mouth, I think I paused and audibly oohed & awed about the wonderful flavors. The fluke was really my kind of food. 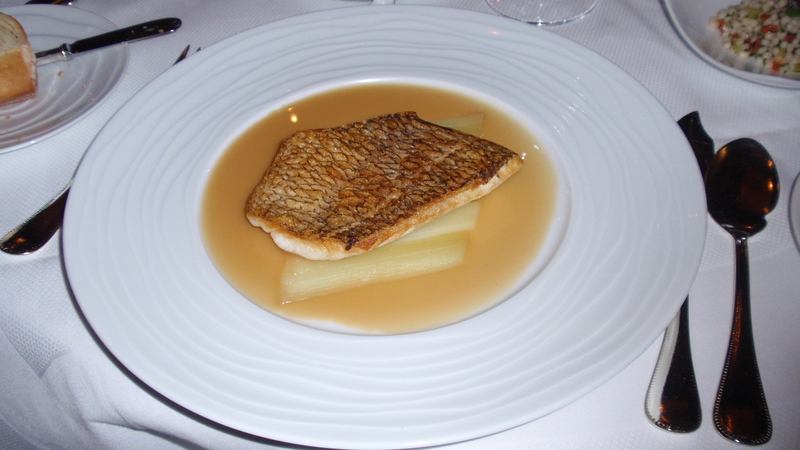 It was some of the freshest tasting fish I’ve ever had, and the citrus and soy nage sauce was the perfect compliment. I loved this dish – it was so fresh and light and had a great little chili kick from the red jalapeños. I think I could have drunk a glass of that sauce. A full 10/10 from me; I would definitely have it if and when I go back. My brother had ordered another ‘almost raw’ dish which was also excellent. I only had a bite of it, but the hamachi was probably the best example of this fish I’ve had (competing for this prize would be a special starter I had at Max London’s a few years ago, where the hamachi had been overnighted from Hawaii and served with citrus flavors over some flatbread). The Vietnamese flavoring was fragrant, gentle and had a good sharpness as well. It was a very accomplished dish. 8/10. My second starter was this amazing-sounding scallop dish. Well, it didn’t disappoint either. The scallops were ‘scorched’ perfectly and they were bursting with that sweet scallop flavor. This was in turn balanced by the rich butter sauce (as it was derived from goat’s milk, it wasn’t too heavy), which had a good kick of garlic and fresh chive flavor. Everyone that got a taste loved it. 9/10. A few people around the table had ordered the sea urchin dish. I have only recently begun to try urchin, and it is not yet a flavor I particularly like. I do understand the attraction, but my palate just isn’t there yet. My brother, however, loves the stuff, and was excited about this dish. 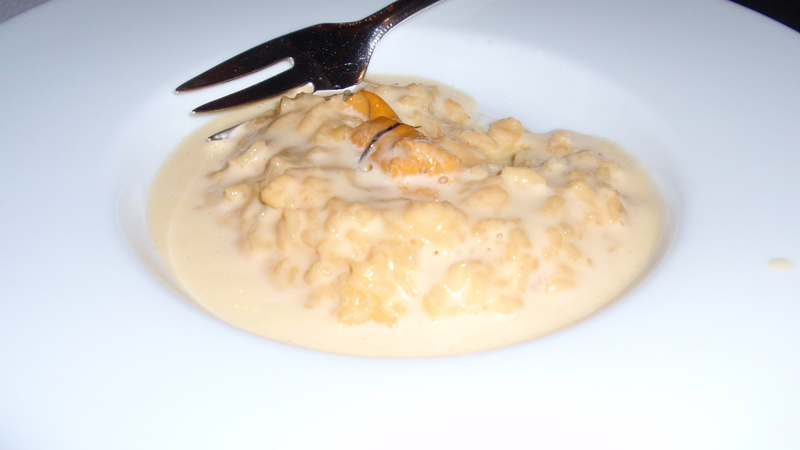 He commented that the risotto was cooked perfectly al dente and, as you can see, it was really creamy. He said that the urchin flavor didn’t come through enough for him though, and he would have liked to taste it more. I did taste the dish and thought it was very good, but not outstanding, and agreed with his assessment. 7/10. My Aunt had the calamari and I only got a tiny bite of the big fleshy part, so will refrain from giving it a score. 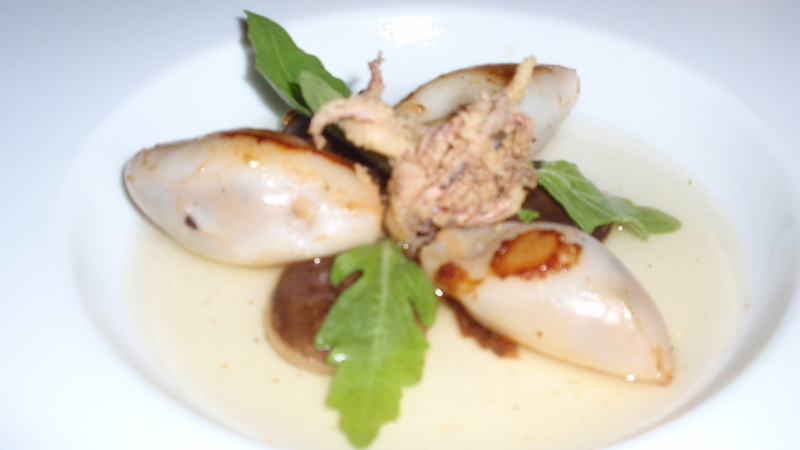 I did think that the squid itself was rather too chewy, which I was really surprised to find in this restaurant, where everything else had been cooked so perfectly thus far. This was the dish a lot of us had been most excited by – I mean, just read the description. It was a bit disappointing, though, if I’m honest. While the langoustine was perfectly fresh and sweet, the other ingredients sort of faded into the background and didn’t add too much. The little mushrooms were excellent in their own right, but they were tiny and didn’t really come through if you took a bite with everything together. Same with the few little flakes of foie gras. I personally think it needed a little more of a sauce with it to lift it beyond a fresh piece of langoustine. 6.5/10. My main course of black cod was an accomplished dish. The skin was just the right crispness and the flesh was moist yet firm. The sauce lent a bit of saltiness and spiciness through the ham and peppercorns respectively, and celery was a good accompaniment. I think I had misread the menu, because I was expecting to see the Iberico ham, but it was only infused in the sauce. This dish didn’t completely bowl me over, but it was very enjoyable. 8/10. The other hotly anticipated dish was the ‘surf and turf’. If you are familiar with American menus, you will know that this usually means a huge hunk of beef served with a lobster or a bunch of shrimp. So this was a clever and refined take on the concept. And boy did it work. This was, in my mind, hands-down the best main course. Each of the three parts was perfect. The kobe beef was as tender and flavorful as you’d expect and had a very nice little jus with a few strands of what I believe were samphire. 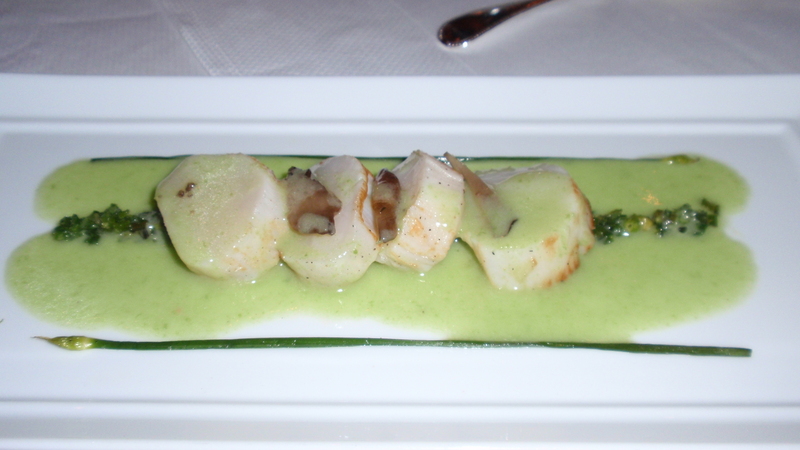 The escolar was by far the best example of this fish I’ve ever tasted. And the little deep fried eggplants (that’s aubergines for British readers) were truly delectable – I could have eaten about two dozen easily. Back on track then: 10/10. 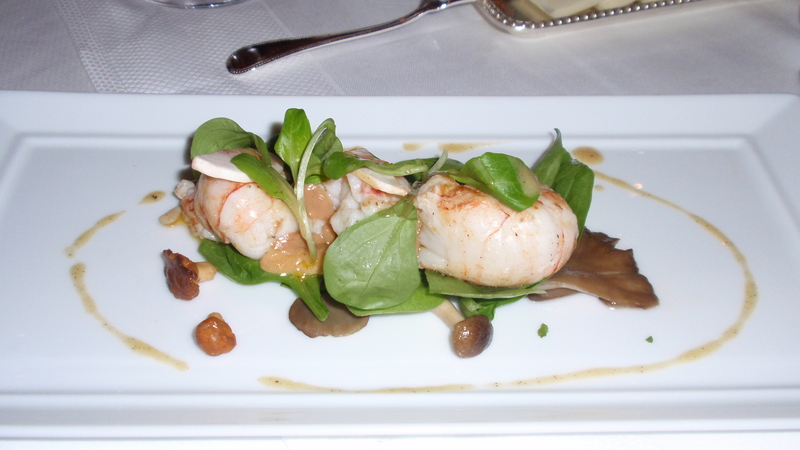 Mrs. LF had this as her main course, and said it was superb – I did get a little taste, and wholeheartedly agreed. She said that “the tabbouleh had a hint of fleur d’oranger and that the dish had a very Middle Eastern and subtle edge to it. The king of this dish was the fish, and it was cooked amazingly well. It had a texture that was unbelievable – very meaty yet soft and delicate, like a springy sponge, almost fluffy. 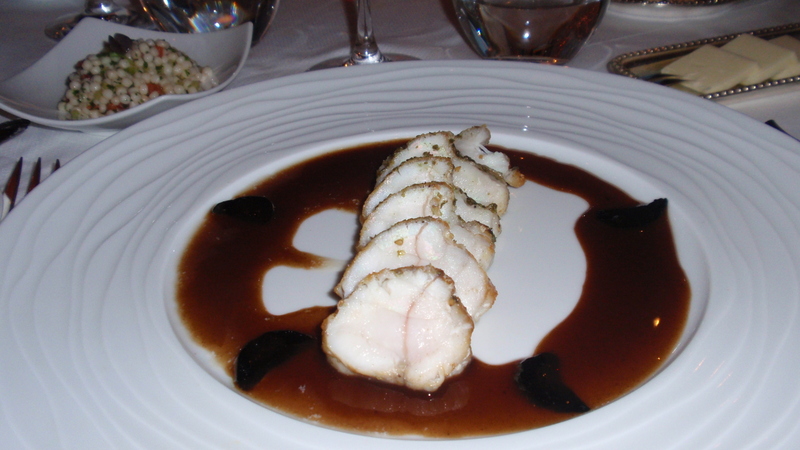 The black garlic and lemon sauce was just as good and simple as it sounded, and was the perfect dressing for the monkfish; it woke up the fish and gave it that kick that it needed. The little bits of black garlic were delicious in the sauce, too. It was a very simple dish that provided an explosion of flavor, and it was also a generous portion. No nonsense, superb.” 10/10. 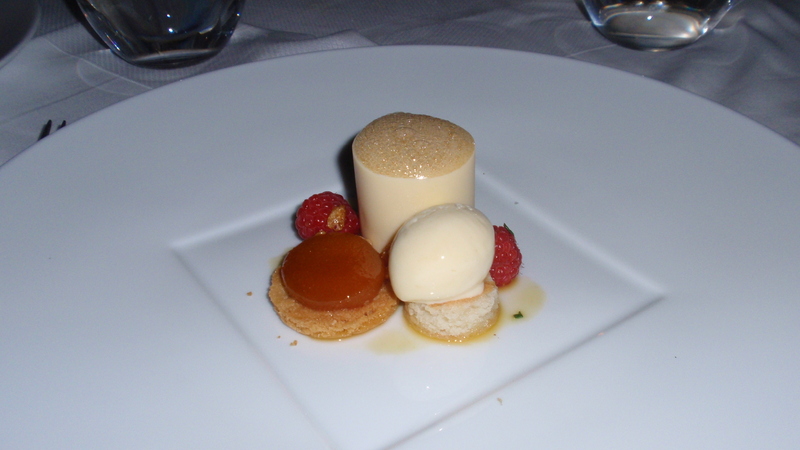 Mrs. LF said of her sweet course: “This was a very light and well executed dessert. The apricot cream was surrounded by white chocolate and those are two flavors that go well together. The little poached apricot had a jammy texture, and was placed on top of a biscuit which added some weight to the dish. The ice cream tasted of yogurt, apricot and almonds, and was also delicate and delicious. It had the advantage of being light and refreshing, yet you didn’t feel that you had been depraved of a ‘real’ dessert, as it was substantial enough.” 8/10. I wish it would have been twice as big. Chocolate and peanuts – where can you go wrong? 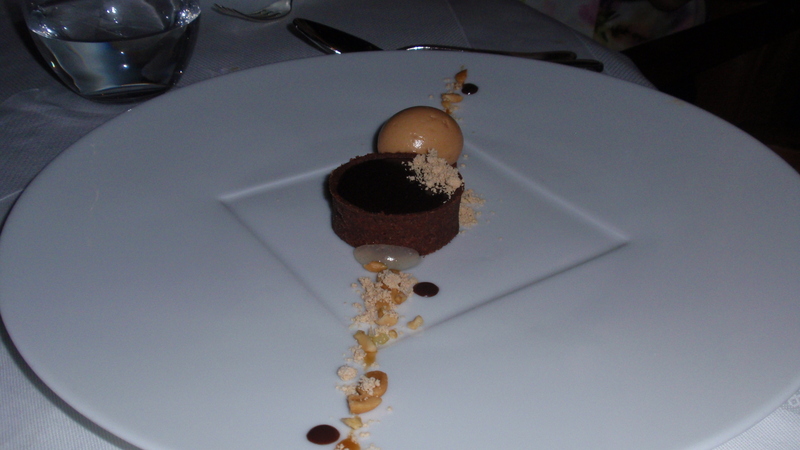 It did everything I had hoped for, the perfect trifecta of deep, rich dark chocolate, peanuts and caramel. The sorbet was a nice pairing as it provided a little bit of sharpness, and I even liked the pralines (believe it or not, I have not historically been a fan of chocolate/hazelnut combos, although my palate seems to be evolving as of late and I am slowly joining the rest of the civilized world). 9/10. Another excellent chocolate dessert, and pretty original too. I loved the combination of the delicate orange meringue and the smooth chocolate cream. 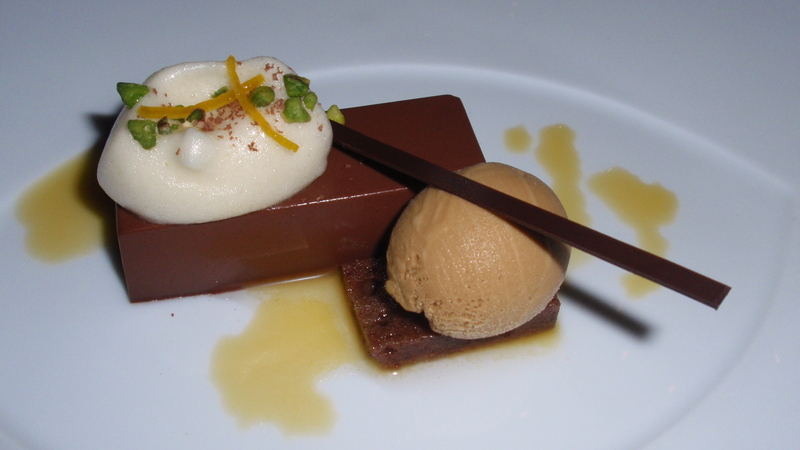 The chicory ice cream really stood out as the star in this dessert, with its slight coffee bitterness perfectly melding with the chocolate cream. 9/10. 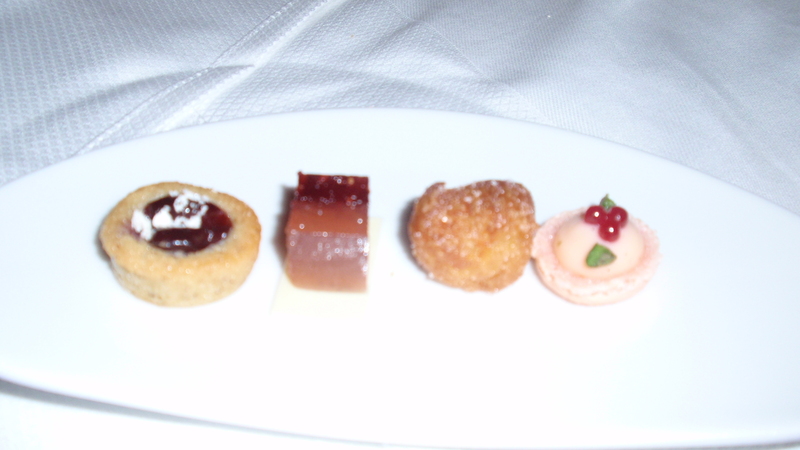 Lastly, we were brought some petit fours to have with our coffees and teas. They were also very good, and beautifully presented as with everything else during the meal. The wine list was extensive and exquisite. We had three wines over the course of the evening, the first of which was a lovely Grüner Veltliner, and the second and third of which were high quality Bordeauxs. The second one (St. Julien) was a bit too powerful for the seafood dishes in front of us if you ask me, but I wasn’t paying on this occasion – my ‘poor’ father was – and I wasn’t going to turn down the chance to taste some of these wines, which I would normally not be able to choose if I were on my own budget! 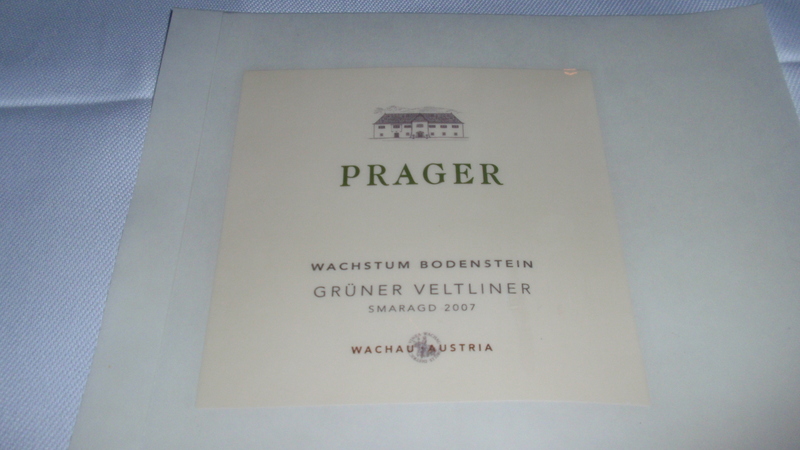 This Grüner went down a treat with the first courses – it was one of the best I’ve had, extremely complex and continually revealing more. It was very lively on the nose, with lots of citrus (grapefruit) which balanced the wine’s honey and peach flavors. It was also quite spicy and had a really zingy mineral streak. It was a little warm on the finish, and left me wanting more. This Bordeaux was still quite closed to me. It had a beautiful dense purple color to it and smelled of blackcurrants and a medley of herbs. It was powerful yet with some finesse, and it did become more and more drinkable as it oxygenated. Still, I felt it overpowered the fish dishes. This superb Bordeaux had a very discreet nose, and didn’t reveal a lot of itself until it had sat in the glass for a while either. It was definitely an elegant and smooth wine. 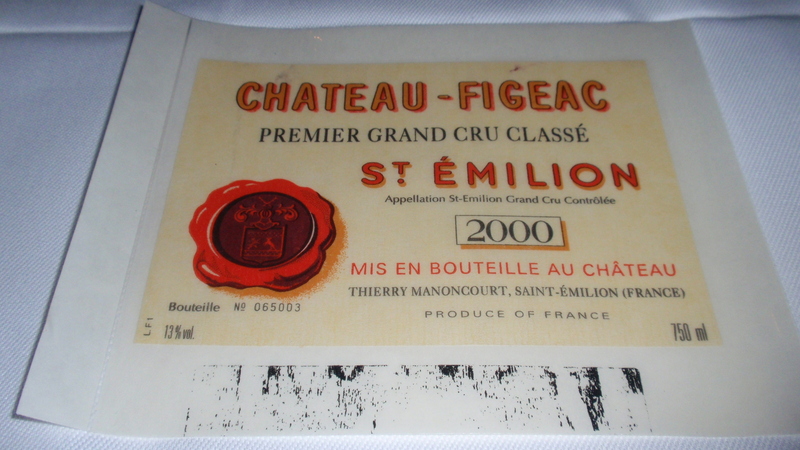 It had slightly smoky or roasted taste to it, with a good dose of ripe fruit and good grippy tannins. Again, maybe not the best choice for the food, but I actually thought this worked rather well with a few of the dishes. All in all, Le Bernardin met my expectations. It wasn’t a perfect meal, as some of the dishes didn’t live up to their descriptions for me (i.e. rather plain langoustine and tough calamari). But then again we did order a lot of dishes, and for the most part they were excellent, with a few standing out as the best examples of the fish I’d ever had. And that is saying something. The desserts were all fantastic, something I hadn’t been expecting after reading numerous accounts of people being underwhelmed by them. The menu by itself is unbelievable and really makes you salivate, but is it too much to take in if you’re not having the tasting menu? With so many amazing things on offer, you feel as if you might be ‘cheated’ if you can’t order the 5-7 that you really like the sound of. I guess this is a good problem to have, though. The service throughout was discreet, professional and attentive, exactly what you’d expect from the atmosphere the dining room exudes. They weren’t overly interactive, but were knowledgeable and friendly when you needed them. The sommelier was Austrian and offered a good deal of insight from what I could gather across the table (he was shocked and delighted when we choose the Grüner as he said most customers from the States don’t even know about it), while letting the customer (my father) arrive at his own decisions. Our main waiter was very classy and the whole thing seemed rather effortless for them, which is not easy with a fairly large table. Le Bernardin is highly worth a visit if you are in New York and want an intimate dinner for two or are celebrating an occasion of some kind. I doubt you’ll be disappointed, and you just may have a dish or two that you won’t be able to forget. 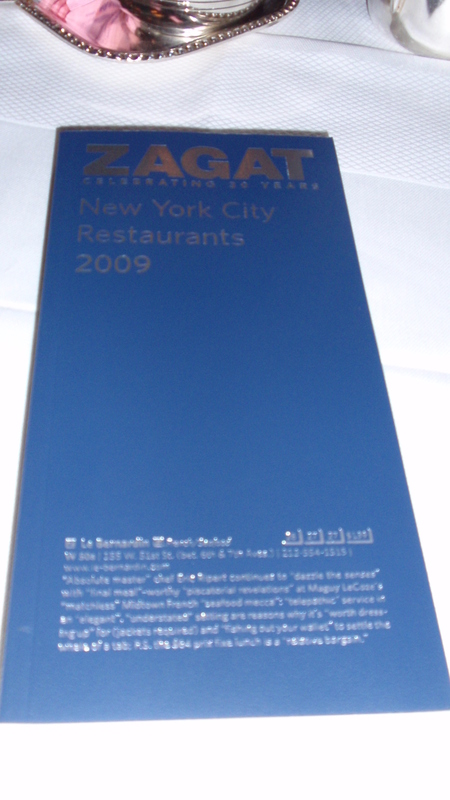 A final note: as we were getting ready to depart, they handed us each a special blue and gold edition of the Zagat New York guide, which has Le Bernardin’s rating and review on the cover. I thought this was a nice little touch.